Two months ago – on July 9th – the mayor of Yerevan – Taron Margaryan – resigned. He had been in the position since 2011. 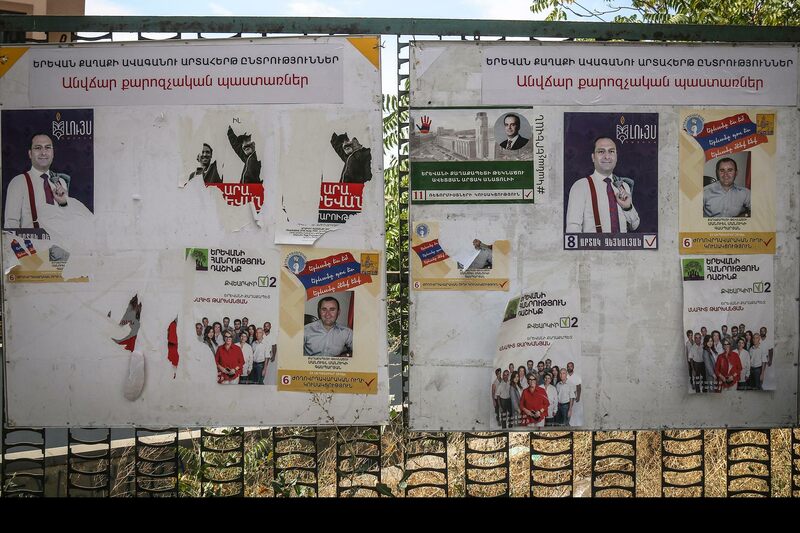 Yerevan delved into the anticipation of early elections of the council of aldermen. The ruling council will be elected in the elections which will be held on September 23rd. Actually, this election is the primary test of the new government after the explosion of the revolution in April-May. A big amount of political parties participate in these elections of aldermen – 4 alliances and 8 parties. For comparison consider the elections of mayor of last May, when there were only 3 parties participating. The winning party of those elections – the RPA – does not even participate in the battle this year. The headquarter of the party “Hayk” (Haykazunner). Number 2 of the list of the aldermen elections Hrachya Sargsyan, who is responsible for the media in the period of pre elections, and the mayor candidate, the president of the party “Nzhdehian Tseghakron” (Nzhdehian Nation Worshippers) Gevorg Hovsepyan. The headquarter of the party “Reformists”. 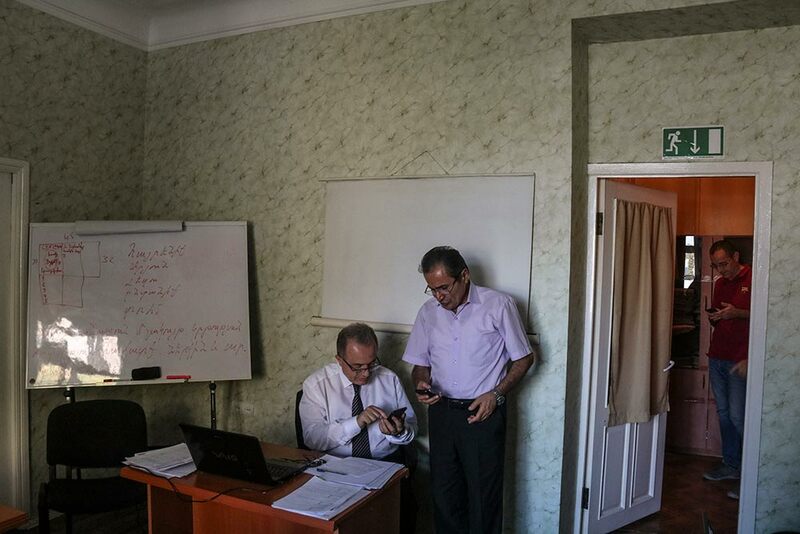 Gayane Ghulyan, on the left, is busy with the questions of legal advice. Lilit Hovakimyan, on the right, coordinates the work with TV channels and radio. She is a member of aldermen, she is number 4 in the elections list and the first woman. 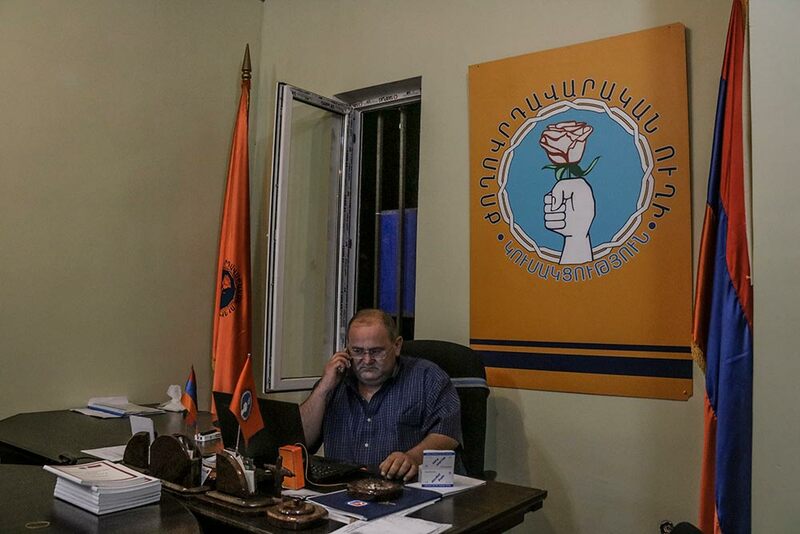 The first headquarter of the party “Yerkir Tsirani” (Country of Apricots). Shushanik Palyan is the media speaker of the party. She replies to the mails and forms the timetable of the media messages. Gevorg Lalayan is the text editor of the party “Zharangutyun” (Heritage). 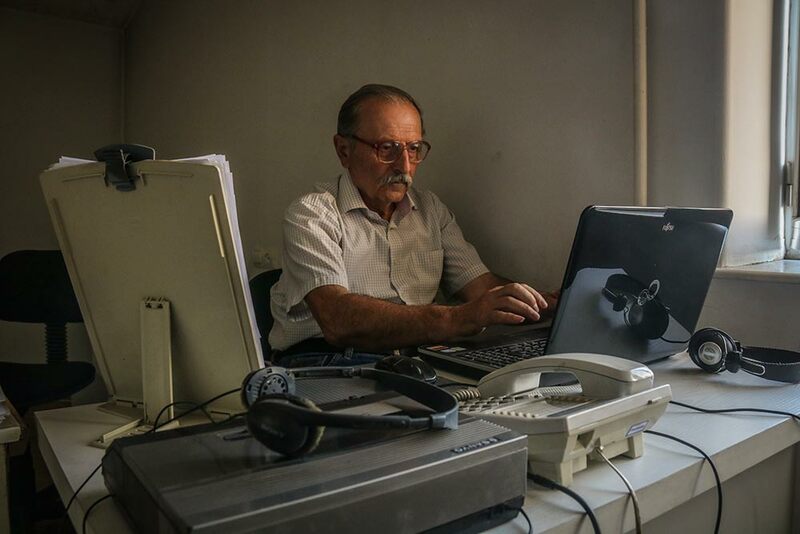 His working room is on the third floor of the office of the party, in a quiet and encouraging atmosphere. 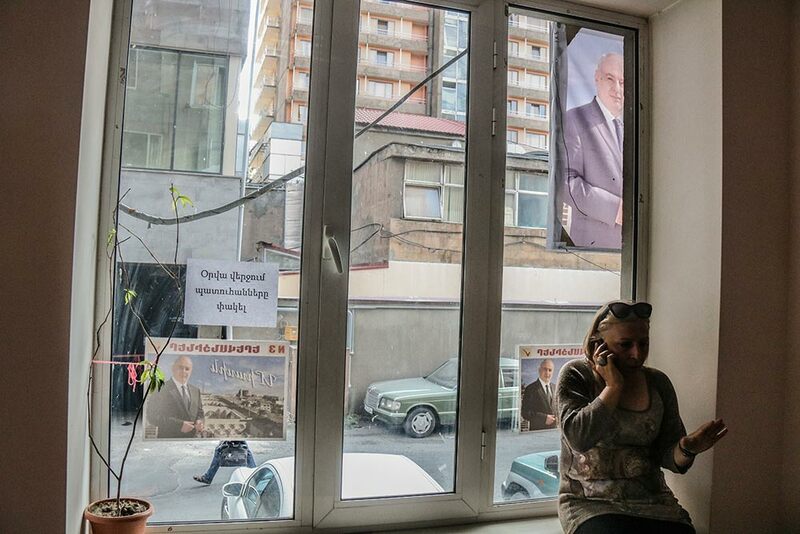 The working headquarter of the party alliance “Yerevani Hanrutyun” (Society of Yerevan). 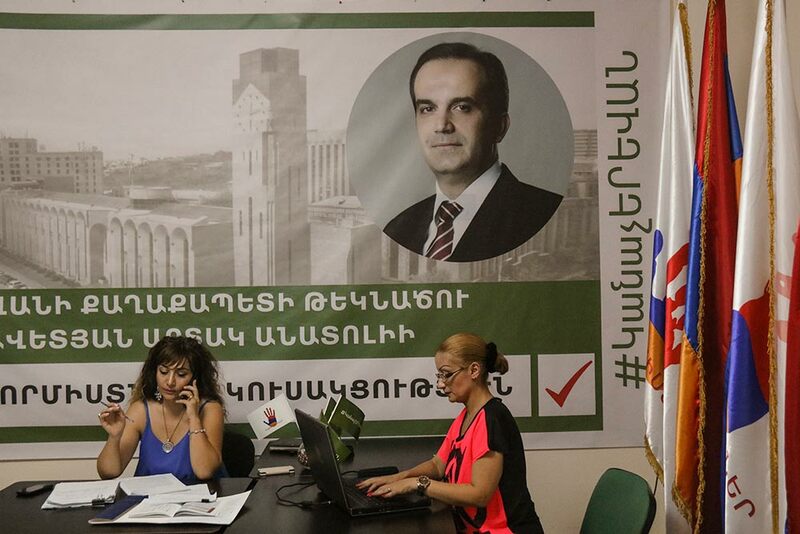 Andrias Ghukasyan is a political figure, and the husband of the mayor candidate of the alliance Anahit Tarkhanyan. The headquarter of the Kentron (Centre) district of the alliance “Im kayl” (My Step). 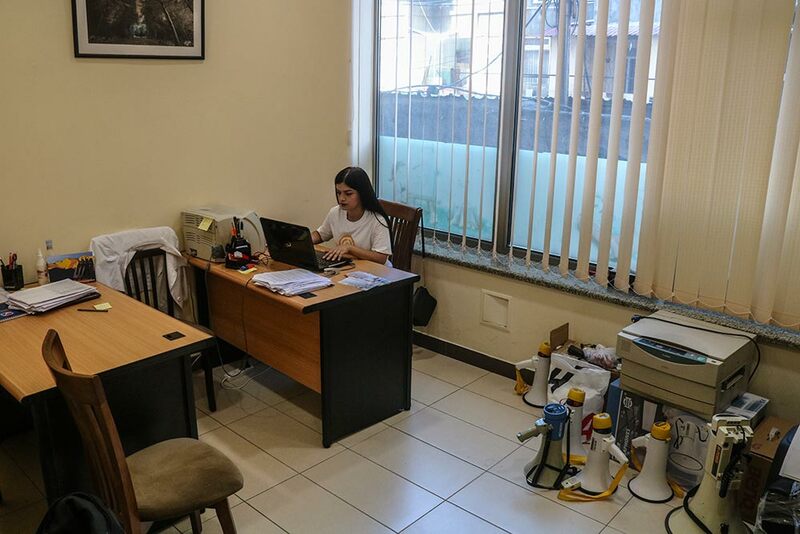 Lilit Kirakosyan is working in the headquarter alone late at night. She primarily fulfills an organizational work, and though she is a candidate of aldermen, she has not yet managed to participate in any of the rallies. In the headquarter of the party “Zhoghovrdakan ughi” (People’s Path). Arthur Gasparyan coordinates everything in this period of pre elections. When he doesn’t manage to wash his hands, he wipes them with alcohol. In the headquarter of “Luys” (Light) alliance after a team meeting. In the headquarter of the party “HYD” (ARF). Araz Gaymagamyan is responsible for the media in the period of pre election. The central headquarter of the alliance “Yerevantsiner” (Yerevanians). Narine Galstyan fulfills the work of organizing and coordinating. 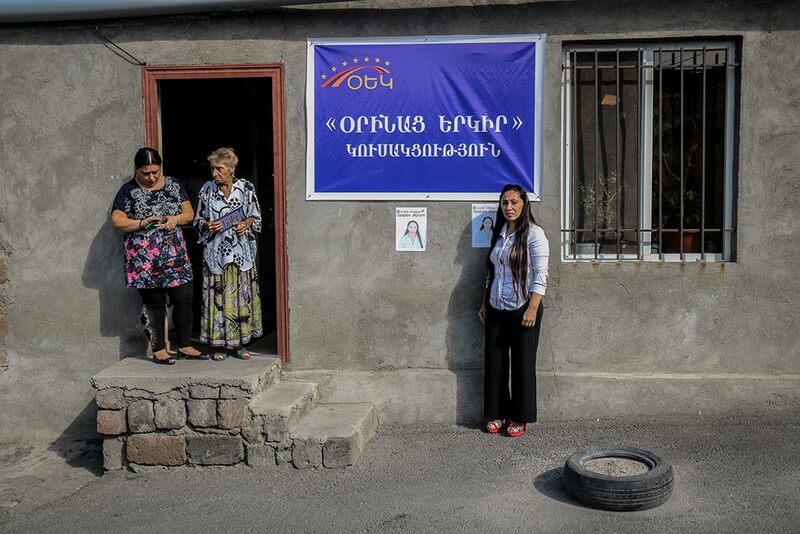 The headquarter of Shengavit district of the party “Orinats Yerkir” (Country of Laws). Lusine Hakobyan is a businesswoman, a tailor. She has been a member of this party since 2002. 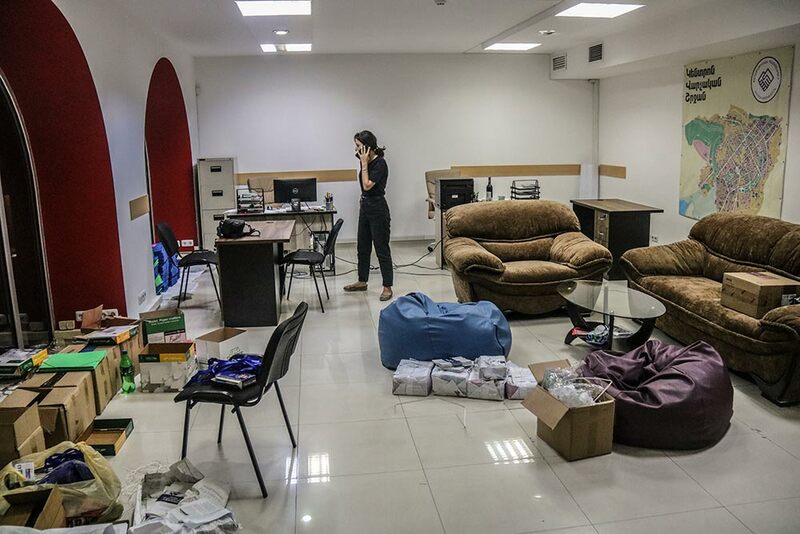 Her apartment on Katovski street serves as a headquarter in the pre election period. 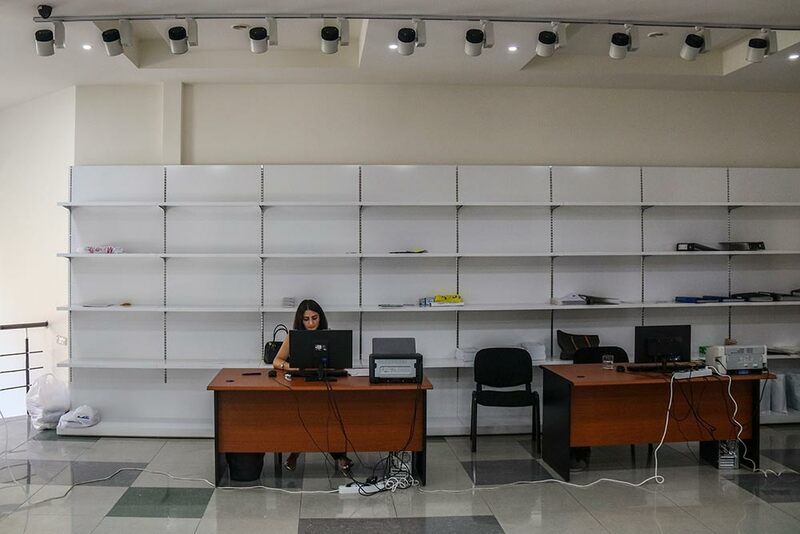 Lusine Hakobyan mainly meets with the complaining citizens in this headquarter. The secretary of the headquarter Meri Hovhannisyan, the party member grandmother Manya and the chair of the pre elections headquarter Lusine Hakobyan. The headquarter of the party “Bargavach Hayastan” (Thriving Armenia) located in the Kentron (Centre) district of Yerevan. 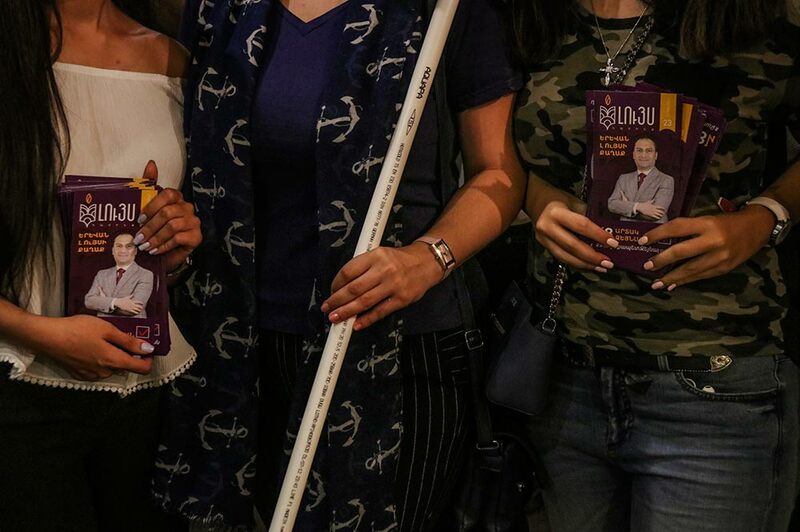 Arevik Navoyan is in the photo, who is busy with the questions of coordinating and keeps the network with other headquarters of the party. It would, nevertheless, be wrong to say that the atmosphere of the city is of a powerful political battle. The times have changed, and the horizontal battle of the streets has smoothly turned into something else and creeped inside the “walls” of Facebook’s vertical current. In this context it is interesting as how the competing sides organize their inner – office – work. Every rally has visible (public) and invisible participants – people who work in the rear – in the headquarters. Remaining under the “shadow” they fulfil an important work – they coordinate the work of others, edit texts, edit photographs, discover counter preaching and violations in the virtual space… their functions are really different. Usually little is known about these people, though especially their work sometimes creates a serious counterbalance. 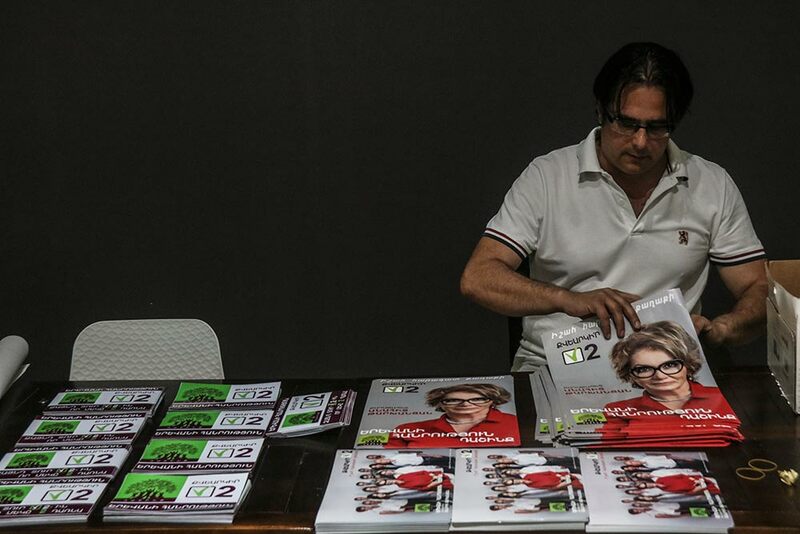 This photo story is about these people, who pass their working 12-18 hours in the election headquarters since the beginning of the rally – September 10.